Sometimes, it doesn’t take much to achieve great success. That is why, like a vineyard owner trying to rush his grapes to the winemaker after a successful harvest, you should start by picking the low-hanging fruit – the quick cash and treasury management wins that pave the way for a triumphant future. With the treasury function increasingly seen as having a unique set of skills to improve the bottom line, treasurers and treasury practitioners are now called upon to help add value above and beyond cash management. For the modern-day treasurer, who wrestles with traditional treasury duties, as well as board-imposed strategic expectations, this means beating the BIG THREE. Monitoring and managing cash positions in real-time to produce daily and intra-day liquidity reports as well as forecast overviews. Identify, evaluate and manage Interest rate, currency and commodity risks to minimise loss. Adding value through process efficiency, improved working capital management and interest optimisation. 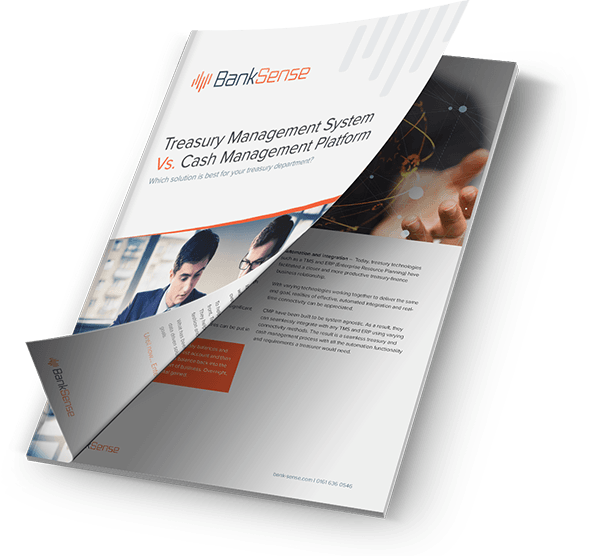 A Cash Management Platform (CMP) can help treasurers beat the big three by helping them; keep a closer eye on cash and liquidity, minimise risk and take advantage of investment opportunities to make profit. Multi-bank cash visibility – Achieving timely cash visibility is tough and can take over a treasurer’s role. Building up a picture of the company’s cash position through multiple CSV downloads, numerous spreadsheets and hours of reconciliation is time consuming. And it’s an even bigger task when you’re dealing with multiple banking systems and subsidiaries across the globe. With multi-bank cash visibility through a CMP, treasures can gather group-wide cash positions and report on global liquidity requirements in real-time – allowing you to make strategic decisions quickly. Coordinate and configure data – Wouldn’t life be easier if everything was organised just how you want it to appear? Analysts spend hours trying to patch together and reconcile data so you can view the information, just the way you want it – only to then start all over again the following day. With a CMP, data can be configured based on bank provider, currency, country and organisational legal entity in real-time – life’s much easier when you know what’s what and where’s where. Right? Detection – BIG DATA! We’ve all heard about the big promise that it holds for treasury and finance. Indeed, when it’s available in real-time and in a legible format, we can make decisions quickly. However, as data sources grow, so does the need for anomaly detection. With finance data overflowing, detecting irregularities is difficult, and when you’re using a spreadsheet treasury model, where you work from sheet to sheet and tab to tab, it’s merely impossible. Luckily for treasurers, with a CMP, data can be benchmarked against standard payments profiles, helping users spot anomalies and missed opportunities, as well as areas where improvements can be made – perhaps there is some truth in this promise after all. Minimise Loss – The emphasis on risk management has continued steadily since the start of the financial crisis. With a decade between then and now, treasurers have moved on from mere cash visibility reporting and have expanded to include a more in-depth look at how risk can be reduced. Never before has there been greater justification for a firm to minimise losses, than today. With a highly volatile macroeconomic environment and unstable foreign exchange rates there’s a great emphasis on reporting that can allow you to act on findings in a proactive and positive way. By using a CMP to automate; large exposure reporting, manage inter-company transfers, reduce negative credit interest and minimise foreign exchange risks, treasurers can feel SMUG as they help to minimise losses, with minimum effort. Sweeping – Treasurers looking to optimise interest payments, minimise cost of borrowing through surplus funds or simply improve overall liquidity can do so by concentrating all their cash into one account, where the interest is at its highest. Without a CMP, this task would require routine manual input of payments, which is both error-prone and difficult to maintain. With no human intervention required, a CMP automates the process as it integrates directly with the payments engine and therefore removes the need for manual sweeping tasks. Analysis – To understand the structure of the finance and treasury function, treasury analysts need to gather up-to-information on cash positions by region, currency, bank and legal entity. Using spreadsheet methodology or even a Treasury Management System (TMS) this task usually takes up a large amount of time, which they would rather spend analysing the data. CMP shifts the treasury role away from data gathering as that is all automated, and to data analysis and strategy execution. Routine tasks such as statement input and reconciliation are automated, allowing you to spend time on jobs that can earn you more money. On-demand – When you’re tasked to produce reports that contain complete, accurate and up-to-date information on current cash positions or future liquidity forecasts, you often feel frustrated by the many hurdles you face in meeting these reporting requirements. With a CMP, this task becomes easy as bespoke organisational reporting requirements can be configured and delivered on demand, allowing you to produce detailed reports that contain the most up-to-date information. Investment opportunities – We all know the benefits that Sweeping can provide to those looking to keep borrowing costs at a minimum, improve liquidity position or optimise their interest positions. However, this vision is for here and now, and not for the future. To achieve this, forecasting is essential. With a CMP, not only do you use real time data to gather information but you can produce forecasts based on regression analysis, allowing you to take early investment opportunities at preferential rates and make moves to hedge funds and save money. Once the vineyard owner takes his grapes to the winemaker his job is done for the season. Unfortunately for you and me this isn’t the case. Treasury and finance professionals must meet these targets daily, however with a CMP the job becomes a lot easier.